Darn it, I guess I’m untrustworthy. That was my reaction when I saw this graphic posted on the Internet. 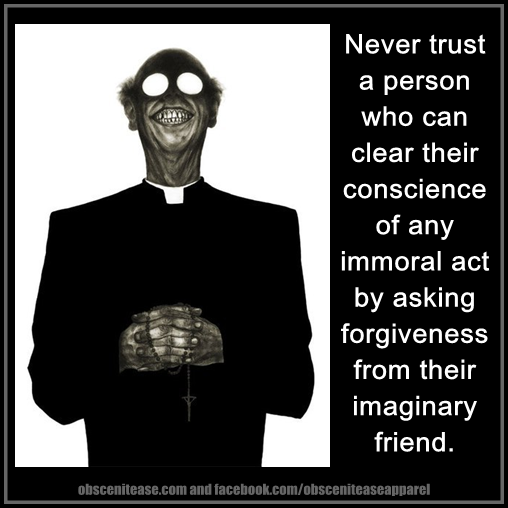 Time and time again, I’ve “cleared my conscience” of my immoral acts by asking for forgiveness from my “imaginary friend”. And it’s worked, too. I’ve been forgiven and had my conscience cleared. But then again, I’m a serious Christian, so I’m certainly not operating under the cynical world view of whoever created this graphic. For example, I don’t treat the act of asking for forgiveness as a ticket to do whatever I like and then effortlessly get off the hook later on. Because I follow Jesus Christ (whom Christians believe is the son of God), I know that He gave up his life to make up for all the wrong things I’ve done and all the right things I’ve failed to do. That’s serious business. And that’s why I don’t take forgiveness lightly. Every time I do something wrong or ignore opportunities to do something right, I’m showing contempt for Jesus’ enormous sacrifice. And every time I come to God with a humble and sad heart, asking for forgiveness, I’m saying what Jesus did matters. What Jesus did really does give me an opportunity to do things differently. Compared to the cynicism of whoever created this graphic, that’s the key difference in how Christians view forgiveness. In our better moments, we don’t see it as ending there. In fact, asking for and receiving forgiveness is only the start of the process. If we’re serious about it, then we open our hearts and minds to becoming the kind of person God knows we can be. We ask for His help in becoming that person and we read His guidebook (the Bible) to learn more about who a follower of Jesus should be and how we can get there. We also go to church services to be surrounded by others who, for the most part, are on the same journey. In this way, we become the prime people God works through, in His mysterious way – to make each of us more like Jesus. Being honest about our shortcomings and honestly seeking forgiveness from God and from each other when we fall short. Seeing everyone – and I mean EVERYONE – as being loved equally by God. Understanding that our world is damaged and God wants to work through us to repair it. Standing up for the oppressed, for the weak, for the poor, just as Jesus did (and continues to do). Being trustworthy, to prove, over and over, that the creator of this graphic is simply wrong. You can join me on this journey. You can open your heart to God, to His gift of Jesus Christ, and then watch in amazement as God begins to change your life. What do you think? Post your reaction below and let’s have a conversation. “Asking forgiveness from my imaginary friend” – a very challenging image. Striving to be more like Jesus and understanding the sheer magnitude of his sacrifice for us is what being a Christian is all about. We can never take the gift of forgiveness lightly. May our lives, through our words and deeds, shine the light of Christ to this broken world! I struggle with the EVERYONE part and so do a lot of people…a huge hurdle but a necessary one to get over; otherwise, that graphic starts to make sense and that is dangerous. Well said again, Frank.